Former Presidential Candidate Michele Bachmann's historic and deluded run in the general direction of the White House is over, but that doesn't mean that the fun has to end! 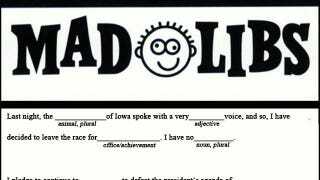 Make your own Michele Bachmann concession speech with these Michele Bachmann Concession Speech Mad Libs! Click to enlarge, or go here to open in a new window. Although they're barely recognizable, every sentence contained in this fun parlor game is a direct Michele Bachmann quote. Share your creations in the comments, but don't use a derivative of "poop" or "butts" for every word. That's only funny if you're six, or stoned. Mad Lib graphic magic courtesy of Ms. Alex Leo.